No one wants to bitten by an animal. Even the most devoted donkey owner will tire of being chomped on by his pet. Miniature donkeys bite due to an assortment of reasons. Determining why your donkey is trying to bite you is the first step in correcting the behavior. Donkeys and other equines have very mobile lips; they can use their mouths in many ways like humans use their hands. Biting behavior often starts out because the animal is mouthy, meaning it wants to grab things with his lips or explore new items and people using his mouth. 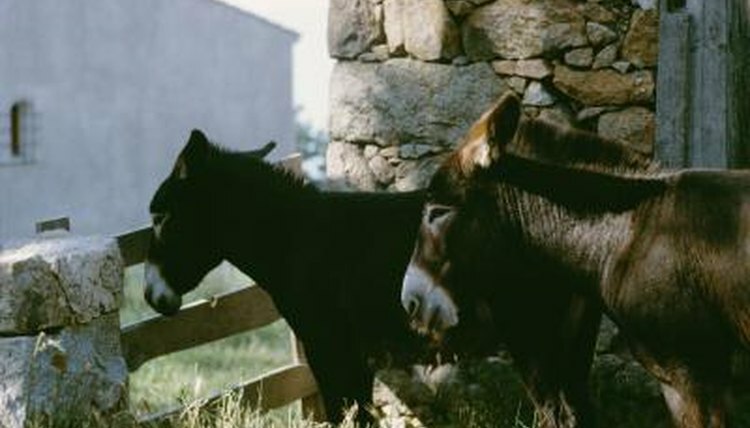 Young donkeys are especially likely to display this curious behavior and may well inadvertently bite someone in the process. Equines also use their mouths to groom one another, which is considered a sign of friendship and affection. If a donkey does it to you, it might feel a lot like being bitten, or at least nibbled on. Miniature donkeys are cute and small, which often makes people more inclined to treat them as harmless pets rather than small equines. Young donkeys need to be trained not to put their lips or teeth on people. A firm verbal "no" followed by a tug on your donkey's halter should be enough of a reprimand to correct a curious young animal who is nibbling on you while trying to explore or gain possession of something, such as a treat. This is also the easiest and simplest way to teach your donkey that, while its okay for you to groom him, you do not really want him to return the favor with his teeth. Donkeys are smart, so it normally takes minimal corrective training to establish that biting is simply not acceptable behavior. Equines bite within herds to establish dominance between individual animals and to maintain the pecking order. If your donkey has not accepted you as his undisputed leader, he may be inclined to try to bite you to establish his own dominance over you. Once again, a firm "no" followed by a tug on a halter or lead rope will suffice for correcting dominant behavior. When dealing with dominant behavior you will want to make certain that you do not give the animal what he wants and that you make him yield to what you want. For example, if he is biting at you in an attempt to make you feed him more quickly, it is essential that you correct him and then force him to stand quietly, and that you do not feed him until he is behaving in a manner that you find desirable. Donkeys are prey animals, but they will behave aggressively if they are afraid. An animal who has been abused or is genuinely afraid of people may behave aggressively when he feels threatened. If your donkey is biting because he is fearful or behaves in a very aggressive manner toward you, you will need to bring in a professional to assess his behavior and help you correct it. Aggressive behaviors include kicking, biting, baring teeth, rearing, striking, charging and pinning ears back against the head.